Amazing 1:18 scale, 10" long diecast - highly detailed with lots of extras. 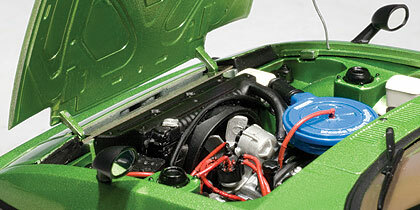 The hood opens to expose the 12A rotary powerplant. 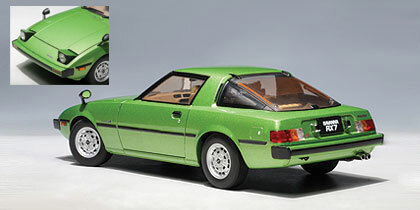 This is a 1978 Japanese RX-7 (introduced in the US as a 1979 model). But all rotary fans will love this one. It is similar to all first generation RX7 cars - 1979 1980 1981 1982 1983 1984 1985. Of course, the 1984 and 1985 SE Mazdas had the 13B motor in them. 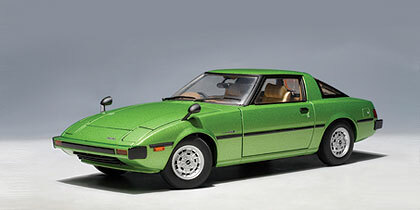 But I am a life long Mazda Wankel enthusiast (I wrote the RX-7 Performance Handbook), and I can't tell you how happy I am to see this diecast finally released.